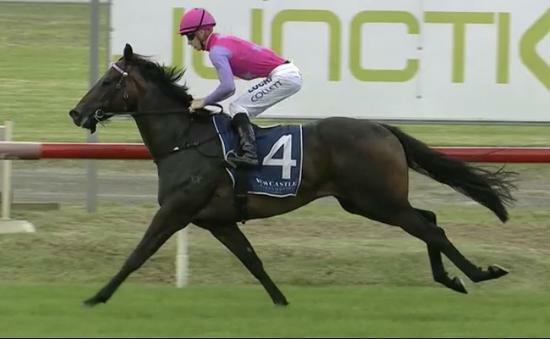 Kim Waugh Racing Stables :: Trumbull Super Impressive Win at Newcastle on Thursday! Trumbull Super Impressive Win at Newcastle on Thursday! Lightly raced 3yo Trumbull resumed from a long lay-off with an exciting and dominant first-up victory at Newcastle on Thursday with Jason Collett aboard. Missing the start Collett had no option but to go back from his outside gate and ride for luck. Pinching runs on the inside Trumbull's electrifying turn of foot came to the fore when the leader hung away from the rail as they worked in to the home straight and under urging from his rider was able to squeeze through the gap and sprint very quickly to score by almost 5 lengths! With 2 wins and 1 3rd from four starts, the son of Darcia Brahma looks certain to add that winning tally in the near future. Congratulations to his patient owners and to all the team!